For the last few years, $600, $650, or maybe even $700 was all you needed to get a brand new top-of-the—line phone. But in 2018, a lot of people are going to tasked with a difficult choice: shell out another $200 or $300 to hit the increased price tags flagships are now demanding, or settle for something a bit more affordable. And at first, this proposition might sound like another frustrating aspect of an increasingly crazy product cycle, but it doesn’t actually have to be that way. 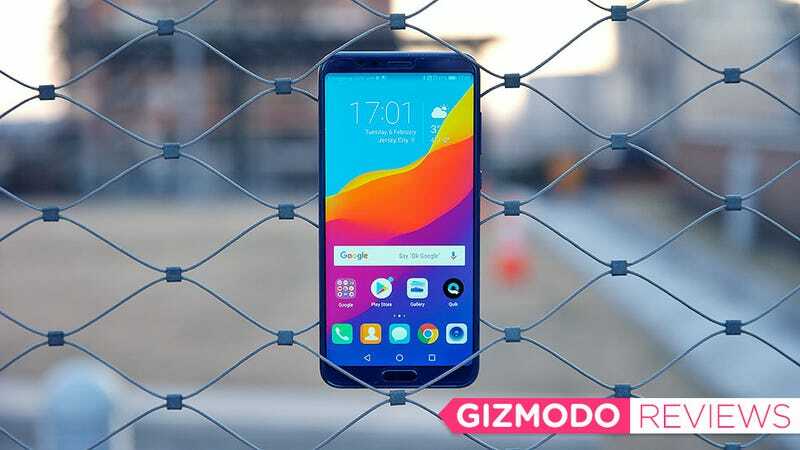 That’s because there are mid-range phones like the $500 OnePlus 5T and this new Honor View 10, that can make that second option feel less like a compromise and more like a good way to stop getting screwed. A quick glance down the spec list reveals that all the most important stuff is there: from the View 10’s extra-tall 5.99-inch 18:9 LCD display, to the built-in front-mounted fingerprint reader, sturdy aluminum build, and the handy headphone jack down below. Even the amount of memory and storage you get are quite impressive, as the View 10 comes with 6GB of RAM and 128GB of storage standard, with the latter being double what you’d get on a standard OnePlus 5T or the pricey $900 Galaxy Note 8. And in case you still need more room for apps and photos, the second slot in the dual SIM tray supports microSD cards too. In fact, the View 10’s biggest flaws are minor omissions, like its lack of wireless charging and water-resistance, and the unfortunate limitation of not having CMDA network compatibility, which means this phone isn’t an option for people on Verizon or Sprint. The other really frustrating thing is that despite being announced at the end of 2017, we’re still waiting on official US pricing and availability. It almost certainly has nothing to do with the espionage concerns leveled at Honor’s parent company Huawei. 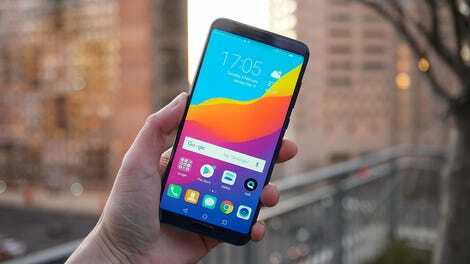 Huawei has run into major difficulties when trying to partner with US carriers to sell its latest flagship, but Honor has always relied on direct-to-consumer sales. After realizing that the View 10's look like a pair of googly eyes, I couldn’t unsee it. My only other quibble with the View 10 is the way Huawei’s EMUI 8 skin looks. It’s one of the most radical departures from stock Android available today, with its rounded notifications cards, lack of an app drawer and iOS-style Share menus. Thankfully, all these things can be customized in the phone’s settings, including the overall look and feel of the UI via the Theme app. I just wish I didn’t have to spend so much time fiddling with everything out of the box. Then there are other things like Honor’s claim of enhanced AI that are meant to improve how the phone functions. It’s a feature borrowed straight from Huawei’s latest flagship, the Mate 10 Pro. However, in real life, the effects of the phone’s extra smarts are often quite hard to discern. Honor claims that machine learning algorithms will automatically tune your phone for better battery life and make sure performance still feels snappy a year or more down the road, but it never does so in a way where you notice it happening, which often leaves you wondering if it’s actually happening. It’s not the most exciting looking phone, but it is relatively handsome, especially in this deep blue color. The two exceptions to this is a custom version of Microsoft’s Translator app, which uses the Honor 10’s Kirin 970’s neural processing unit to deliver on-the-fly exchanges using either, written, spoken or even text captured in a picture. In my short time I spent testing it by spitting admittedly poorly pronounced Chinese at the Honor 10, it almost always came back with the correct response. However, once again, when compared side-by-side with other big translating apps from Google and others, it was hard to tell how much heavy lifting the View 10’s AI was really doing. Unlike many fingerprint sensor/home combos, the View 10's front button doesn’t have a tactile press, but it can be used to control the phones using gestures, by swiping up, down, left, and right. On the other hand, the View 10’s AI-enhanced camera makes it easy to tell when the phone’s silicon smarts are helping. Using image recognition, the phone can identify a handful of different subjects like cats, dogs, plants, food and more. And when it does, it’ll pop up a little corresponding icon in the bottom of the phone’s camera UI, while using that knowledge to automatically adjust camera settings to get the best pic possible. When it works, it really does feel a bit like magic. In a side-by-side shot between the View 10 and the OnePlus 5T, after correctly determining I was taking a photo of a plant, or what’s better know as my lazy attempt to use tech to grow basil indoors, the View 10 produced a shot with better white balance and more detail in the shadows for a more pleasing image overall. It’s not a night and day improvement, but it is noticeable. But when not assisted by AI smarts, I found colors from the View 10 were often more muted than those from the OP5T. And in low-light, things weren’t even close, as evidence by a dimly shot of everyone’s favorite cuddly sci-fi birds in the slideshow below. Though, to be honest, that’s not entirely unexpected as the OnePlus’ secondary camera was designed specifically to improve low-light photography. The View 10 tries to counters with a second rear cam of its own that sports a 2x zoom lens, similar to what you’d get on the iPhone X or Galaxy Note 8. It’s not anything I’d call essential, but it does give you a little more creative freedom when it comes to shooting stuff far away. See that little leaf icon in the bottom right? That’s how you know the AI is working. Click through to see more camera comparisons. It’s subtle, the with the AI working, the View 10's photo is brighter, more vivid and has slightly more detail than the OnePlus 5T’s pic. Even though the View 10 can sometimes identify landscapes, it didn’t this time, which resulted in muddier more muted colors than what I got from a OP5T. The biggest difference between the two came while testing low-light, though it’s not very surprising as the OP5T’s secondary camera was specifically designed to produce better pics on poorly lit environments. This is the kind of magnification you can expect from the View 10. For reference, that little thing sticking up in the middle is the Statue of Liberty. Honor even caps everything off with a relatively large 3,750 mAh battery, which did a fine job in our rundown test as it kept the View 10 going for just over 10 hours (10:04 to be exact). That time compares pretty favorably to results from the Note 8 (10:13) and the iPhone x (9:56), though it’s still an hour short of the Pixel 2 XL (11:17), OP5T (11:22), and its more expensive sibling, the Mate 10 Pro (11:13), which were three of the longest lasting phones I tested last year. Is the Honor View 10 as sleek or tech-laden as the Galaxy Note 8 or iPhone X? No, and it’s not really that close. But as those phones continue to push the price of flagship devices even higher, they are also leaving a lot of people simply looking for a good device behind. And the Honor View 10 is just that, a solid phone with good specs, tons of storage, and some nice bonuses such as dual rear cams, a headphone jack and a bit a AI smarts. Now here’s hoping Honor stops sandbagging its US release, so that people can have even another good option for resisting the rise of the super premium smartphone. Not everyone wants a OnePlus 5T. The View 10 sports a big, bright 6-inch 18:9 display and brushed aluminum back, but doesn’t have wireless charging or any form of water-resistance. Huawei’s EMUI 8 can be a little jarring for people used to stock Android, but it’s quite customizable. Colors from the rear cam can look muted, especially when not enhanced by the camera’s AI, but the secondary 2x zoom cam is a nice bonus. Only works on GSM networks (i.e. AT&T and T-Mobile). Still no official US pricing or release date, despite getting announced in November 2017.